Which Trane Heat Pumps and Thermostats Are The Best? Your home’s heating, ventilation, and air conditioning system should be durable, quiet, and economical. With so many components to pay attention to, it can be difficult to purchase and maintain the best appliance for your home’s needs, especially with the change in seasons – until now. Trane XV20i Variable Speed: This variable speed heat pump is part of the Trane TruComfort systems line, which gives you precise comfort by running at the exact speed necessary even as the outside temperature changes. Trane heat pumps can automatically adjust itself to heat and cool your home efficiently (up to 20.00 SEER and 10.0 HSPF), while simultaneously creating a clean and comfortable environment for your family. The ComfortLink™ II communicating technology is available when matched with the proper indoor unit and connects all of the key HVAC components to configure and calibrate for optimal performance. It “simplifies service and maintenance, while improving charge accuracy for enhanced reliability and efficiency,” due to Charge Assist™, according to the manufacturer. It’s easily installed with a two-wire connection and is protected by full-sided galvanized steel panels that also preserve airflow. Homeowners can also consider the Trane XL15i, which offers up to 16.25 SEER and 9.7 HSPF. All units are potentially ENERGY STAR® qualified when installed as part of a matched Trane system. Trane XL824 Connected Control: This programmable thermostat allows homeowners to control it from a Wi-Fi-enabled device. It monitors indoor and outdoor temperatures, so homeowners can adjust the HVAC system to optimal energy efficiency. It also precisely calibrates and tests system components regularly for long-lasting performance. The Trane thermostat alerts users of maintenance needs like air filter changes, creates up to 6 daily heating and cooling schedules, and comes with built-in Nexia™ Home Intelligence Z-Wave Bridge (which can give homeowners a 5-day weather forecast and weather radar). 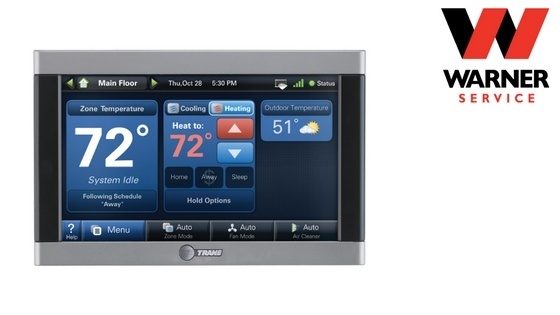 Homeowners can also consider the Trane XL850 and XL950, which have the same benefits of a programmable thermostat. These heat pump and thermostat models are the most popular with our happy customers because Trane has held the highest rating of consumer satisfaction and reliability rating for many consecutive years.